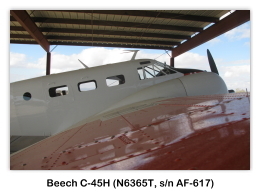 The Beechcraft Model 18, or "Twin Beech", as it was better known, is a 6-11 place, twin-engine, low-wing, conventional-gear aircraft that was manufactured by the Beech Aircraft Corporation of Wichita, Kansas. 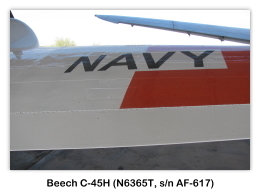 This model saw military service during and after World War II in a number of versions including the United States Army Air Forces (USAAF) C-45 Expeditor, AT-7 Navigator, AT-11 Kansan; and for the United States Navy (USN), UC-45J Navigator and the SNB-1 Kansan. An estimated aggregate total time in service for the aircraft is in excess of 20,000,000 hours. 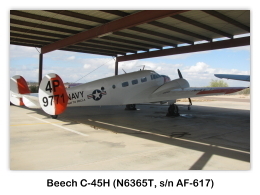 The Beech 18 is the most modified U.S.-certified aircraft design, with over 200 Federal Aviation Administration (FAA) approved Supplemental Type Certificates (STC's) on record for the aircraft. 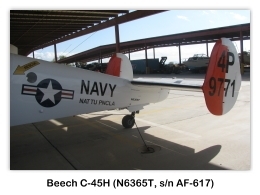 The aircraft's uses have included aerial spraying, sterile bug release, fish seeding, dry ice cloud seeding, aerial fire-fighting, airborne mail pick up and drop, ambulance service, numerous movie productions, skydiving, freight, gun- and drug-smuggling, engine test bed, skywriting and banner towing. A number of Model 18's were operated as passenger aircraft; the Model 18 was the first aircraft flown by Philippine Airlines, Asia's first and oldest airline. Many are now in private hands as prized collectibles. 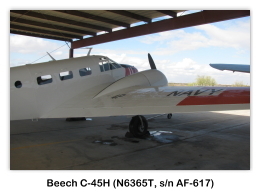 By the late 1930's, Beechcraft management speculated that a demand would exist for a new design dubbed the Model 18 which would have a military application, and increased the main production facilities. 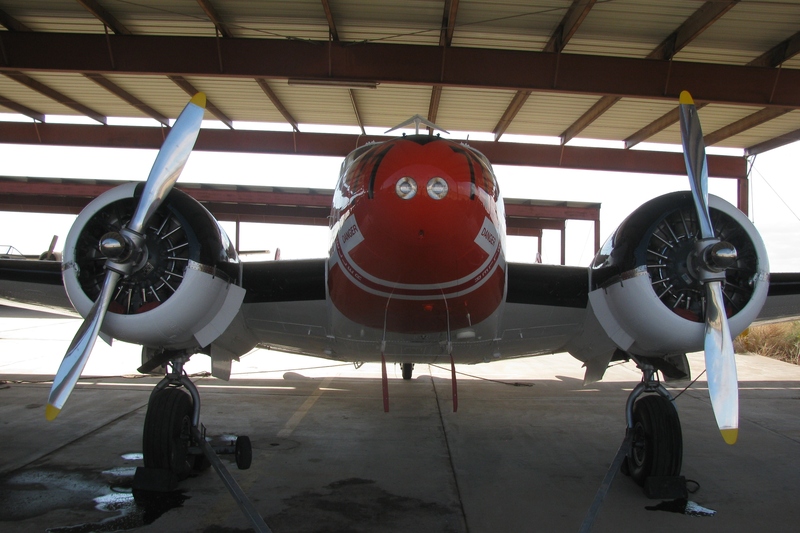 The design was mainly conventional for the time, including twin radial engines, all-metal semi-monocoque construction with fabric covered control surfaces and "tail-dragger" undercarriage, while less common were the twin tail fins. 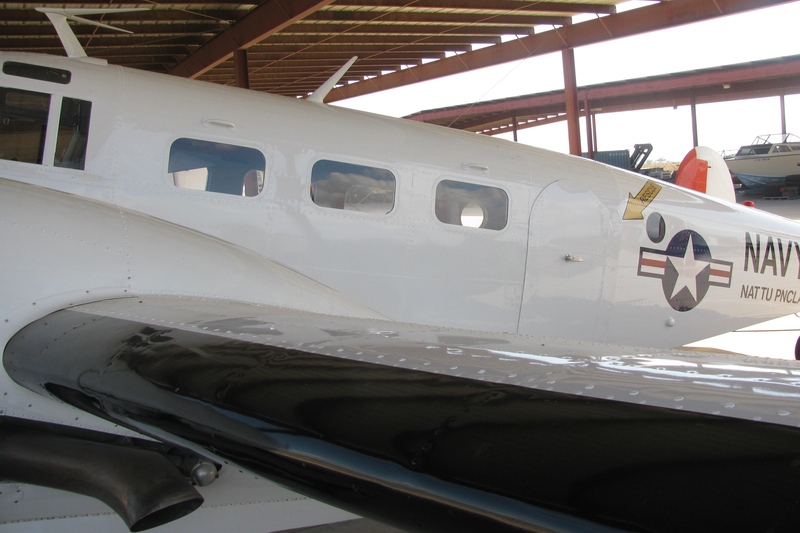 Upon an immediate glance they can be mistaken for the larger Lockheed Electra series of airliners which closely resemble the Model 18. 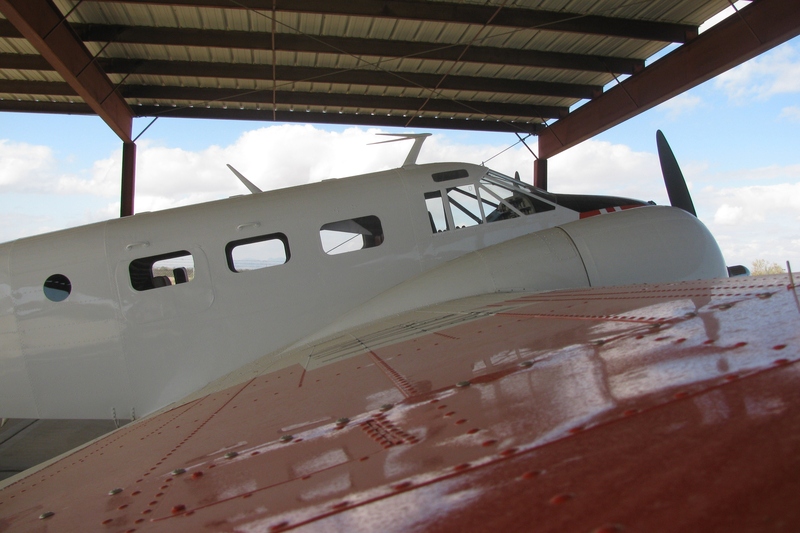 Early production aircraft were either powered by two 330 hp (250 kW) Jacobs L-6's or 350 hp (260 kW) Wright R-760E's. The 450 hp (295 kW) Pratt & Whitney R-985 became the definitive engine from the prewar C-18's onwards. 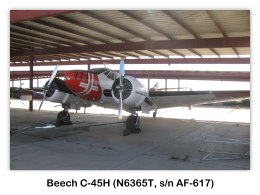 The Beech 18 prototype first flew on 15 January 1937. 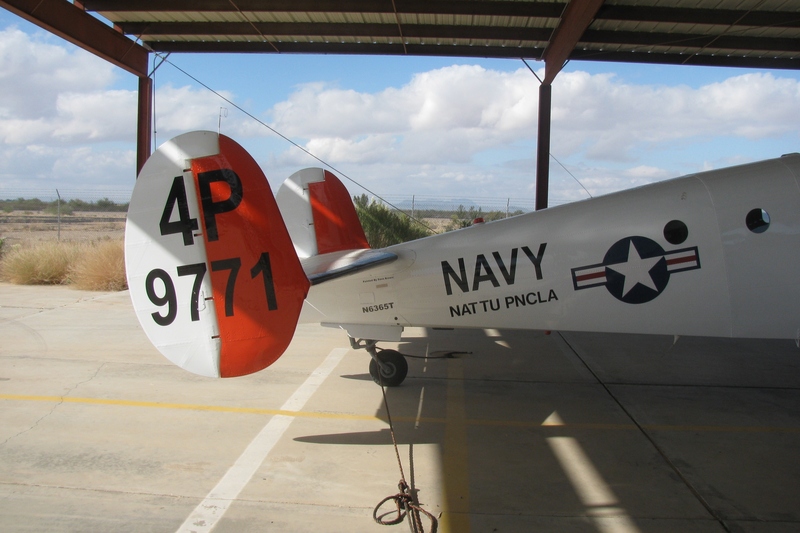 The aircraft has used a variety of engines and has had a number of airframe modifications to increase gross weight and speed. 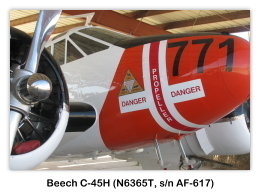 At least one aircraft was modified to a 450 kW (600 hp) Pratt & Whitney R-1340 powerplant configuration. With the added weight of approximately 200 lb (91 kg) per engine, the concept of a Model 18 fitted with R-1340 engines was deemed unsatisfactory due to the weakest structural area of the aircraft being the engine mounts. 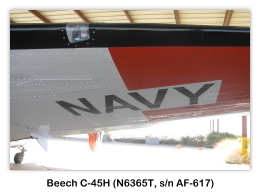 With the exception of the center truss (the central component around which the entire aircraft is built), nearly every airframe component has been modified at one time or another. In 1955 deliveries of the Model E18S commenced; the E18S featured a fuselage that was extended 6 inches (150 mm) higher for more headroom in the passenger cabin. 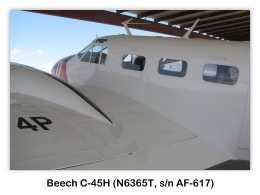 All later Beech 18's (sometimes called Super 18's) featured this taller fuselage and some earlier models (including one AT-11) have been modified to this larger fuselage. The Model H18, introduced in 1963, featured optional tricycle undercarriage. Unusually, the undercarriage was developed for earlier-model aircraft under an STC by Volpar, and installed in H18s at the factory during manufacture. A total of 109 H18's were built with tricycle undercarriage, and another 240 earlier-model aircraft were modified with the undercarriage. 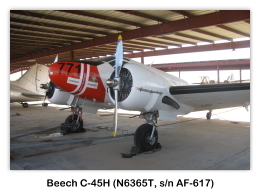 Construction of the Beechcraft Model 18 ended in 1970 with the last, a Model H18, going to Japan Airlines. 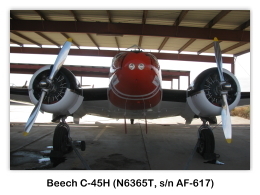 Beechcraft set a record that still stands today for longest continuous production of a piston engine aircraft. Through the years, 32 variations of the basic design had flown, over 200 improvement modification kits were developed, and almost 8,000 aircraft had been built. 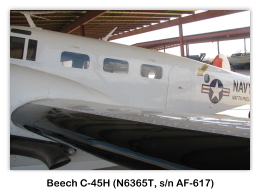 Some aircraft were almost unrecognizable as having originated as a Beech 18. 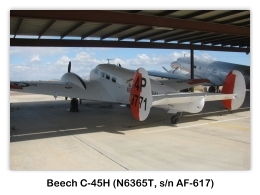 In one case the aircraft was modified to a triple tail, tri-gear, hump backed configuration and appeared similar to a miniature Lockheed Constellation. Another distinctive conversion was carried out by PacAero as the Tradewind. This featured a lengthened nose to accommodate tricycle undercarriage, and the Model 18's twin tails replaced with a single fin. 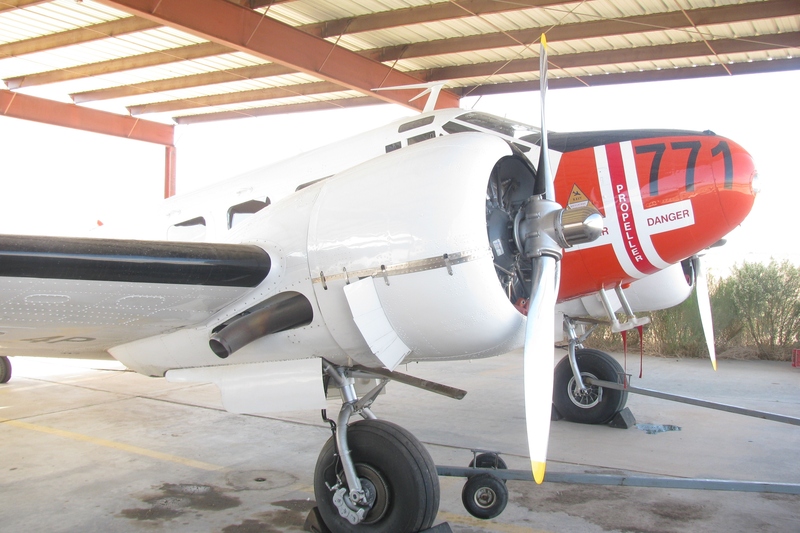 Production got an early boost when Nationalist China paid the company US$750,000 for six M18R light bombers, but by the time of the U.S. entry into World War II, only 39 Model 18's had been sold, of which 29 were for civilian customers. Work began in earnest on a variant specifically for training military pilots, bombardiers and navigators. The effort resulted in the Army AT-7 and Navy SNB. 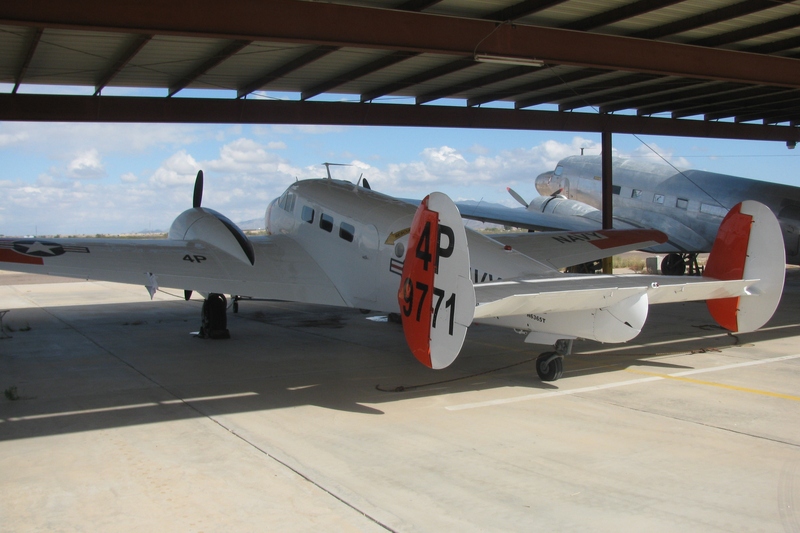 Further development led to the AT-11 and SNB-2 navigation trainers and the C-45 military transport. 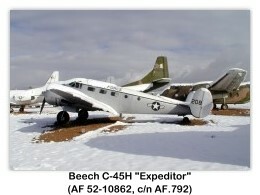 The United States Air Force Strategic Air Command had Beechcraft Model 18 (AT-11 Kansans, C-45 Expeditors, F-2 Expeditors (the "F" standing for "Fotorecon"), and UC-45 Expeditors from 1946 until 1951. 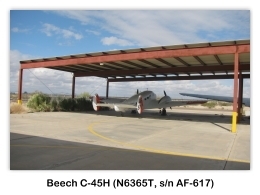 From 1951 to 1955 the USAF had many of its aircraft remanufactured with new fuselages, wing center sections and landing gear to take advantage of the improvements to the civil models since the end of World War II. 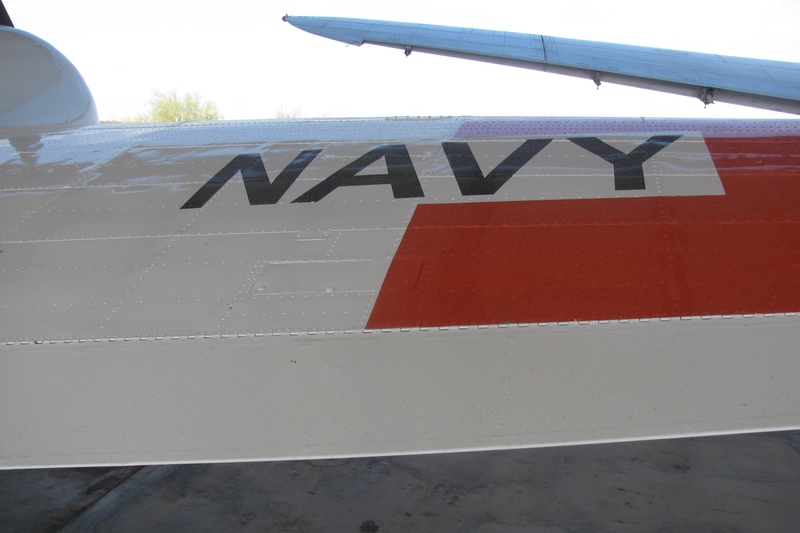 Eventually 900 aircraft were remanufactured to be similar to the then-current Model D18S and given new designations, constructor's numbers (c/n) and Air Force serial Numbers (s/n). 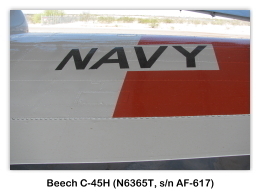 The USN had many of its surviving aircraft remanufactured as well, these being re-designated as SNB-5's and SNB-5P's. 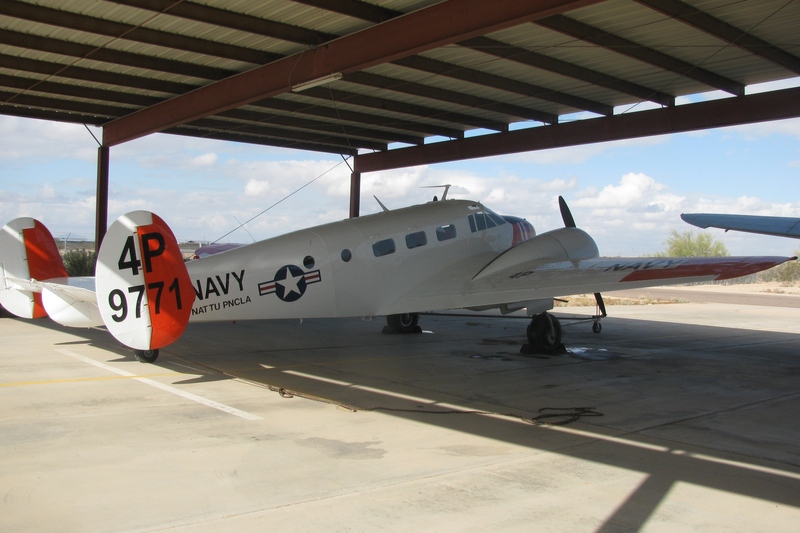 The C-45 flew in US Air Force service until 1963, the USN retired their last SNB in 1972 while the U.S. Army flew their C-45's through 1976. 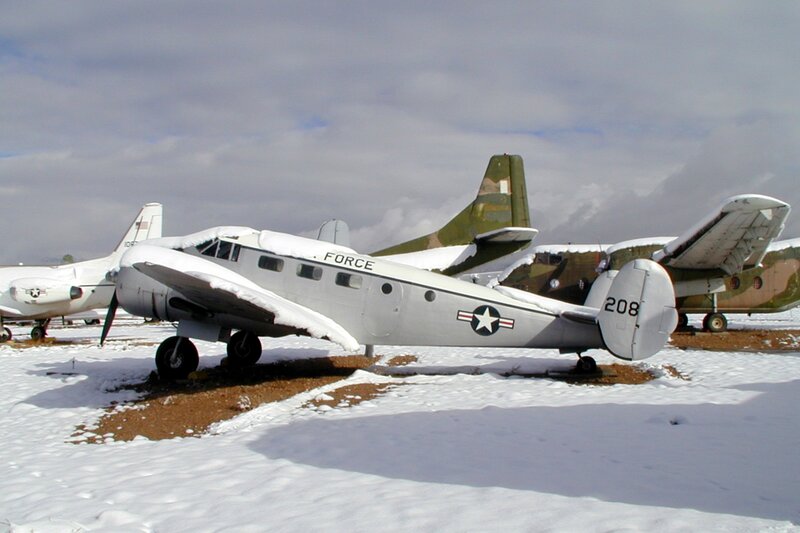 In later years the military called these aircraft "bug smashers" in reference to their extensive use supplying mandatory flight hours for desk-bound aviators in the Pentagon. Some of the modifications created by independent engineering entrepreneurs were adopted in concept by the factory in later production versions in similar fashion to the current practice Harley Davidson copying of custom motorcycles built in the 1960's and 1970's. Among the most notable cooling air and exhaust modifications were those engineered by Benjamin Israel while employed by Conrad Conversions. His modifications were based largely on creating a more efficient use of cooling air to reduce drag, a major detriment to cruise performance. Cruise performance was improved 10% or more at the same power settings as before the modifications. These modifications were largely copied on the factory produced G and H models. 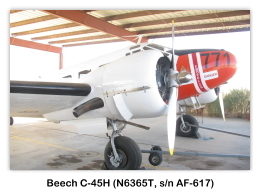 Beech 18's were used extensively by Air America during the Vietnam War; initially more-or-less standard ex-military C-45 examples were used, but then the airline had 12 aircraft modified by Conrad Conversions in 1963 and 1964 to increase performance and load-carrying capacity. The modified aircraft were known as Conrad Ten-Twos, as the maximum take-off weight (MTOW) was increased to 10,200 lb (4,600 kg). The increase was achieved by several airframe modifications, including increased horizontal stabilizer angle-of-incidence, redesigned landing gear doors, and aerodynamically-improved wing tips. Air America then had Volpar convert 14 aircraft to turboprop power, fitted with Garrett AiResearch TPE-331 engines; modified aircraft were called Volpar Turbo Beeches and also had a further increase in MTOW to 10,286 lb (4,666 kg). A factory option at one point was the addition of JATO bottles on each engine nacelle which added the equivalent of 200 horsepower (150 kW) per engine for about 12 seconds. 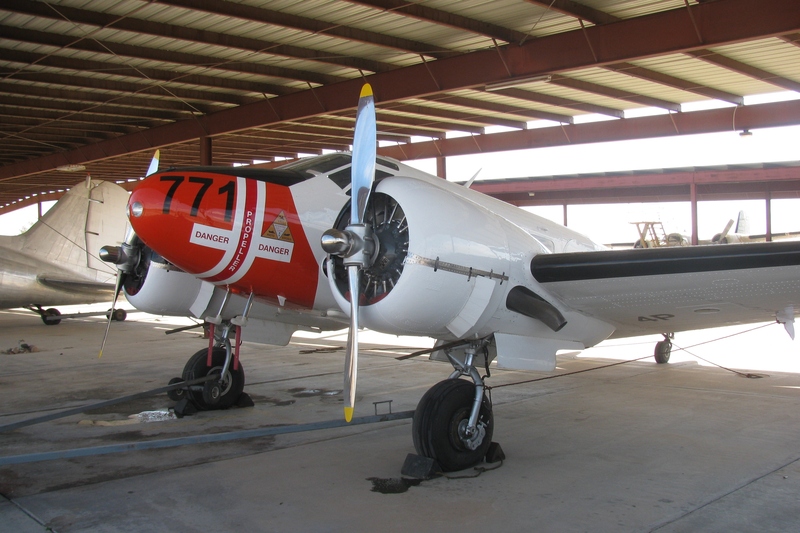 The most successful powerplant upgrade was that of the Pratt & Whitney Canada PT6 turbine engine and Hartzell propeller. This conversion was carried out by Hamilton Aircraft in the 1960's and 1970's as the Hamilton Westwind, successfully extending the commercial life of the aging aircraft. 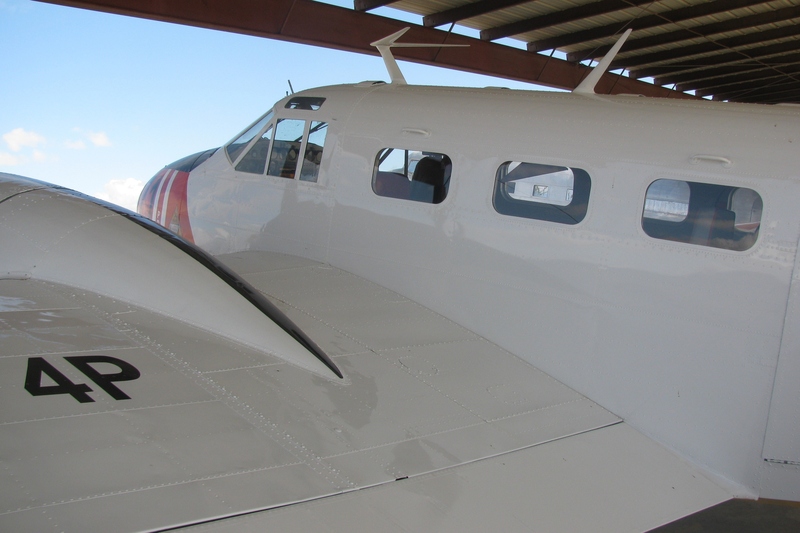 The Westwind II added a fuselage stretch to provide seating for 17 passengers, the Westwind III seated eight and used the remainder of the extra room for cargo, and the Westwind IV added an extra stretch and a large cargo door. The wing spar of the Model 18 is fabricated by welding an assembly of tubular steel. 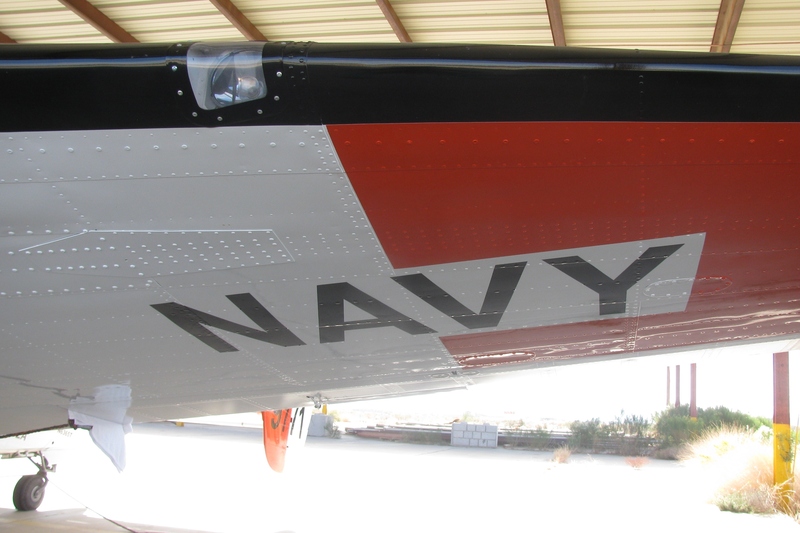 The configuration of the tubes and inadequate corrosion inhibitors, along with holes from after-market STC modifications have allowed the spar to become susceptible to corrosion and cracking while in service. 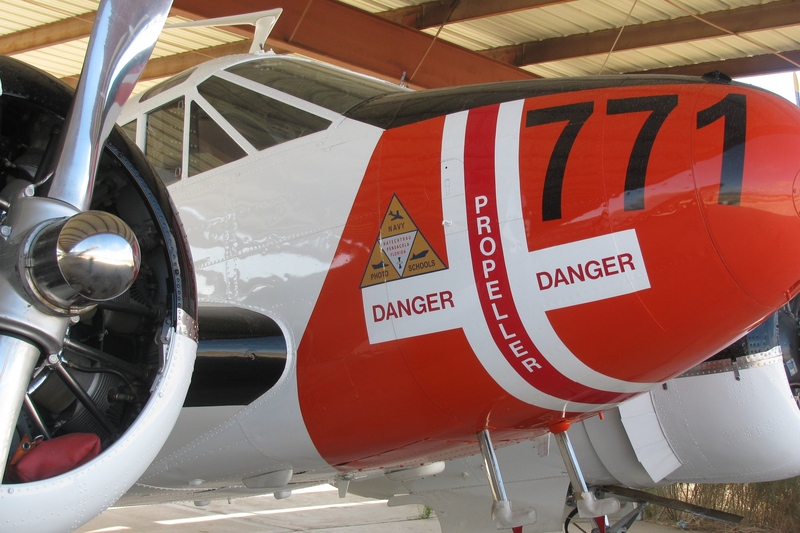 This prompted the FAA to issue an Airworthiness Directive in 1975, mandating the fitment of a spar strap to Model 18's. 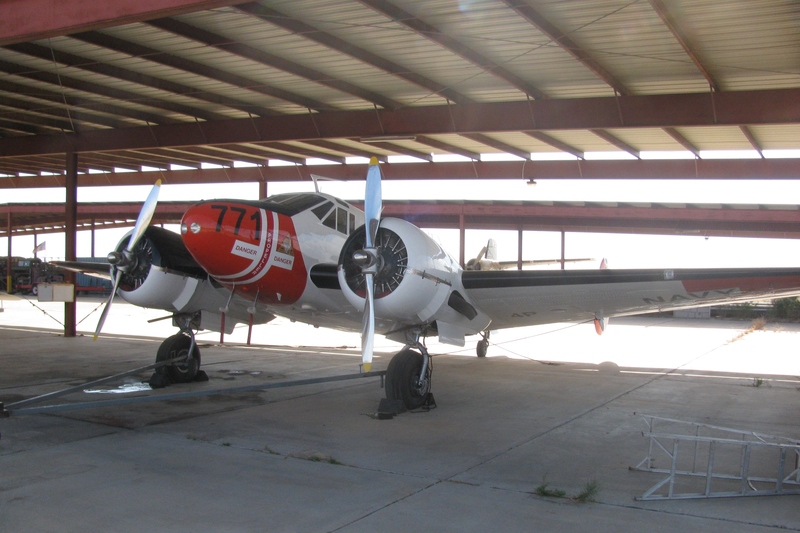 This led in turn to the retirement of a large number of Model 18's when owners determined that the aircraft were worth less than the cost of the modifications. 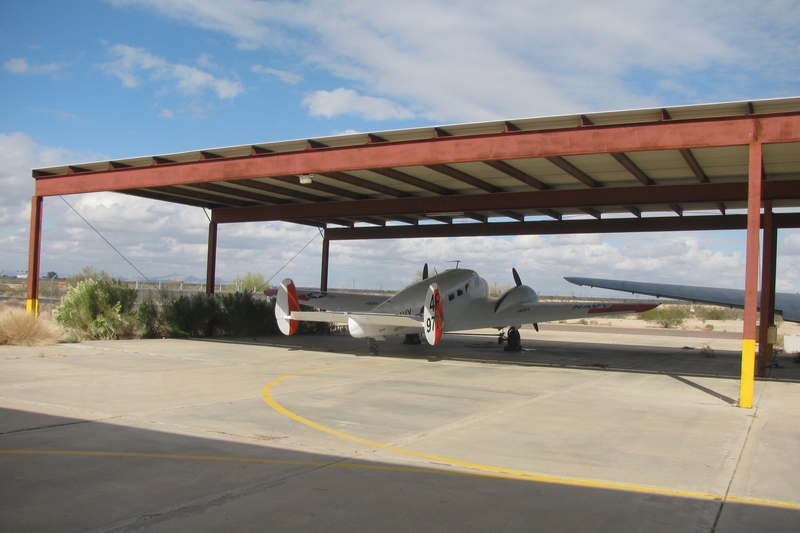 Further requirements have been mandated by the FAA and other national airworthiness authorities, including regular removal of the spar strap to allow the strap to be checked for cracks and corrosion and the spar to be X-rayed. In Australia the airworthiness authority has placed a life limit on the airframe, beyond which aircraft are not allowed to fly. Model 18A — First production model with seating for two pilots and seven or eight passengers, fitted with Wright R-760E-2 engines of 350 horsepower (260 kW). MTOW: 6,700 lb (3,000 kg). Model S18A — Version of Model 18A capable of being fitted with skis or Edo 55-7170 floats; MTOW: 7,200 lb (3,300 kg). Model 18B — Improved model with increased range and useful load, fitted with 285 hp (213 kW) Jacobs L-5 engines. Model 18D — Variant with seating for two pilots and nine passengers, fitted with Jacobs L-6 engines of 330 horsepower (250 kW). MTOW: 7,200 lb (3,300 kg). Model S18D — Version of Model 18D capable of being fitted with skis or Edo 55-7170 floats; MTOW: 7,170 lb (3,250 kg). Model A18D — Variant of 18D with MTOW increased by 300 lb (140 kg) to 7,500 lb (3,400 kg), fitted with Jacobs L-6 engines. Model A18A — Version fitted with Wright R-760 engines of 350 horsepower (260 kW). MTOW: 7,500 lb (3,400 kg). Model SA18A — Seaplane version of Model A18A, fitted with Edo 55-7170 floats; MTOW: 7,170 lb (3,250 kg). Model 18R — Model with Wright R-975 engines of 420 horsepower (310 kW); seven built, one to Sweden as an air ambulance, six to Nationalist China as M18R light bombers. Model D18S — First post-World War II variant introduced in 1945 with seating for eight passengers and MTOW of 8,750 lb (3,970 kg). 1,035 built (c/n A-1 to A-1035). Model D18S-3N — Version of D18S delivered to the Royal Canadian Air Force (RCAF); 100 built (c/n A-601 to A-700, re-serialed as CA-1 to CA-100). Model D18S-3NM — Version of D18S delivered to the RCAF; 133 built (c/n A-702 to A-715, A-736 to A-755, A-767 to A-769, A-780, A-782, A-784, A-786, A-788, A-790 to A-800, A-851 to A-930; re-serialed as CA-102 to CA-115, CA-136 to CA-155, CA-176 to CA-194, CA-201 to CA-280). Model D18S-3TM — Version of D18S delivered to the RCAF; 48 built (c/n A-701, A-716 to A-735, A-756 to A-766, A-770 to A-779, A-781, A-783, A-785, A-787, A-789 and A-931; re-serialed as CA-101, CA-116 to CA-135, CA-156 to CA-175, CA-195 to CA-200 and CA-281). Model D18C — Variant with Continental R9-A engines of 525 horsepower (391 kW) and MTOW of 9,000 lb (4,100 kg), introduced in 1947. 31 built (c/n AA-1 to AA-31). Model E18S — Variant with redesigned wing and MTOW of 9,300 lb (4,200 kg); 403 built (c/n BA-1 to BA-402 and BA-497). Model E18S-9700 — Variant of E18S with MTOW of 9,700 lb (4,400 kg); 57 built (c/n BA-403 to BA-433, BA-435 to BA-460). Model G18S — Superseded E18S, MTOW of 9,700 lb (4,400 kg); 155 built (c/n BA-434, BA-461 to BA-496, BA-498 to BA-562, BA-564 to BA-579, BA-581 to BA-617). Model G18S-9150 — Lightweight version of G18, MTOW of 9,150 lb (4,150 kg); 1 built (c/no. BA-563). Model H18 — Last production version, fitted with optional tricycle undercarriage developed by Volpar and MTOW of 9,900 lb (4,500 kg); 149 built (c/n BA-580, BA-618 to BA-765), of which 109 were manufactured with tricycle undercarriage. 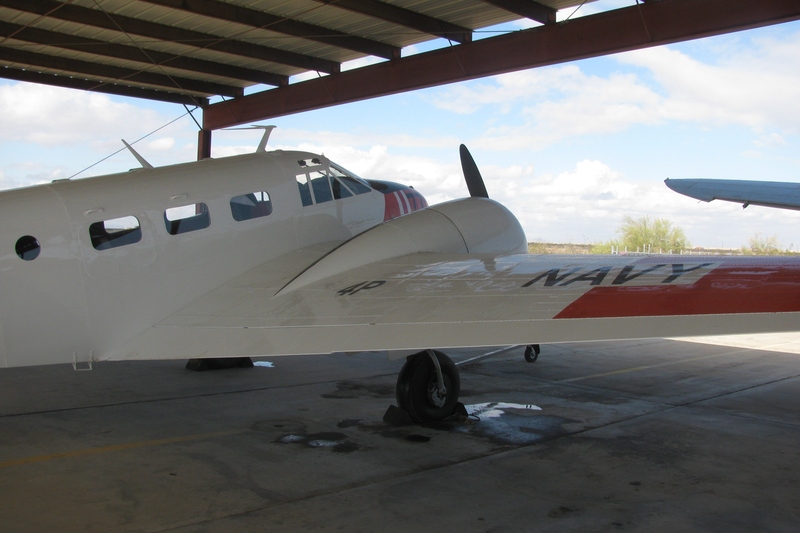 UC-45J — AT-7 Navigator navigation trainer based on C18S, with an astrodome and positions for three students. Powered by 450 hp (336 kW) R-985-25 engines. 577 built. 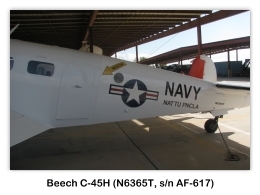 SNB-1 — Variant for the US Navy, similar to AT-11. 110 built. 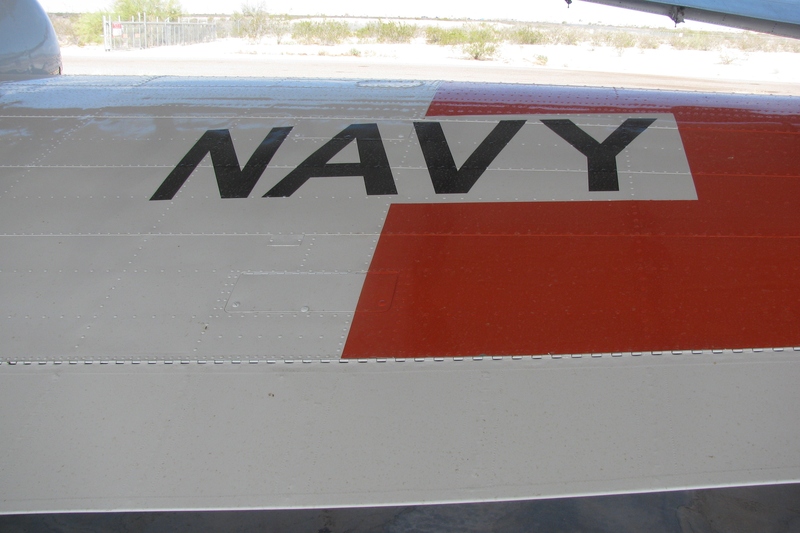 SNB-2 — Navigation trainer for the US Navy. Similar to AT-7. 299 built. 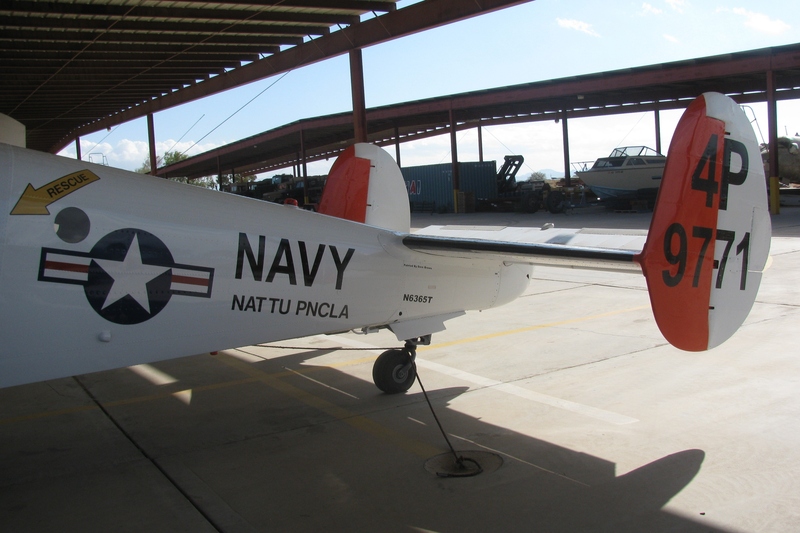 SNB-2C — Variant for the US Navy, similar to AT-7C. 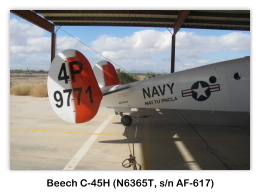 SNB-3 — Variant for the US Navy, similar to AT-7C. 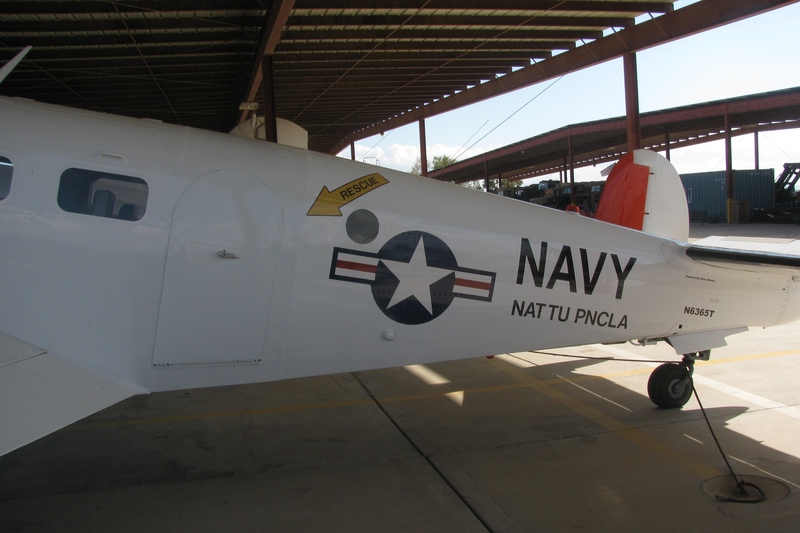 SNB-5 — SNB-2's and SNB-2C's were remanufactured, and designated SNB-5 by the US Navy.